It’s been a while since I’ve had a blooming tea, so I decided that now was the time. 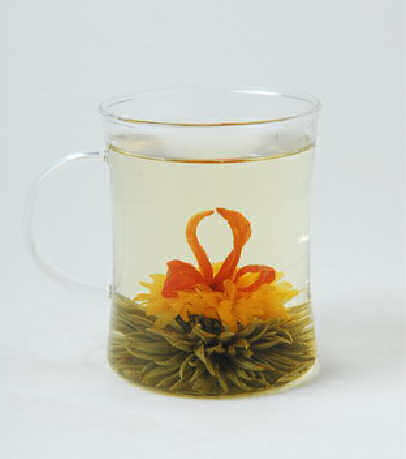 I have really enjoyed the blooming teas that Alice’s Fine Teas offers, so I was pretty confident I’d enjoy this one too. After steeping for six minutes in 175°F water, the bloom was open, but, I fear that my glass cup was not quite tall enough to see the full effect of the white floral extension (as shown in the photo above). To the right, you’ll see what the bloom appeared like with a slightly shorter glass. Still beautiful, even though the extension was not fully visible. But even more important (at least to me) is the flavor of the tea, and I am not at all disappointed with the flavor of this blooming tea. It is light, sweet, and even a little creamy! The floral notes are present but in keeping with the overall lightness of the tea, and they do not overwhelm the flavor of the silver needle tea. The floral is not entirely jasmine here, as I can taste the lily flavor too. I like that even though it is a combination of flowery flavors, it doesn’t taste like perfume or soap. It tastes more like … spring. Like the freshness of spring: crisp air, full of life as the flowers begin to bloom after winter’s frosty chill. A very fun and delicious tea!